The Classic Afternoon Luxury Cruise departs from Vilamoura in the central Algarve and is a great option whatever the occasion. The Afternoon cruise option has long been a popular choice and with departures points at Vilamoura Marina offers the opportunity to make the most of the afternoon sunshine and heat of the day. As with all options we have some flexibility to accomodate your wishes for the afternoon cruise option so rop us a message with your ideas and we will suggest an appropriate itinerary. 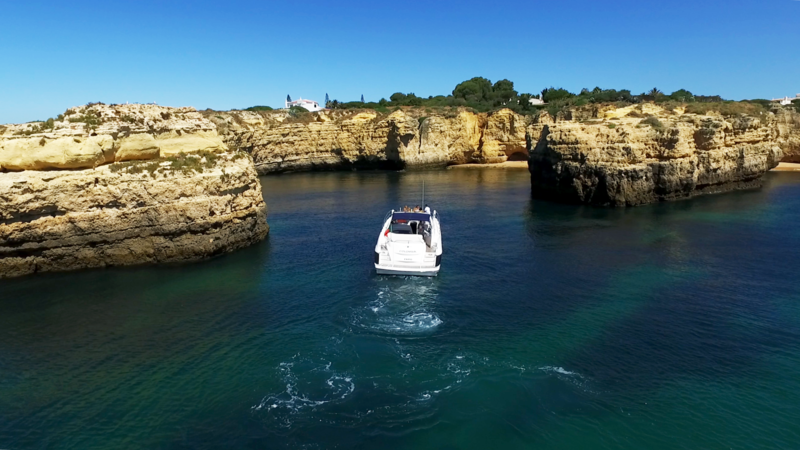 The Afternoon Cruise on the Private Charter fleet typically departs from Vilamoura Marina in the heart of the Algarve but in certain cases we can arrange pick ups from other locations. The departure time is generally + / -14.00 but can vary with the time of year and the choice of boat. On departure from Vilamoura Marina we will head west (turn right) where we will cruise gently down the coast at around 350 metres distance from the shore line of Falesia beach. The afternoon 3 / 4 hour cruise option will take in the following beaches and rock formations / sea caves. The exact schedule is always tailored to the weather and sea conditions on the day which is a huge advantage of having a private yacht charter and not a group tour. On a typical cruise we will cruise west for approximately 1 hour, we will get as close to the coastline and caves as is safely possible. We have incredibly experienced crew and with the correct tide and wind conditions we can even take you inside Xorino cave which is a highlight of the tour. We will drop anchor for some time to swim and play in the water. Some of the boat options have snorkelling gear, some SUP (Stand Up Paddle boards), others have inflatable RIB boats to explore hidden beaches and the smaller caves. TRANSPORTATION AVAILABLE, SEND ENQUIRY FOR QUOTATION. Our prices always include taxes, fuel, crew, insurance. We pride ourselves on being family friendly and our charters are designed with your needs in mind. We are very used to taking into account the needs of children, from young babies to adrenaline seeking teenagers rest assured that we are here to make the cruise experience both safe, and enjoyable. To help us plan the trips we really appreciate you letting us know about you group, any special occasions, the ages of children on board and any other details you can let us know to make the day more special. We ask for a 30% deposit to secure a date, with the balance payable on the day by cash or visa / mastercard.